In her current body of work, Elaine Florimonte is drawn to the simplicity and consistency of the horizon. 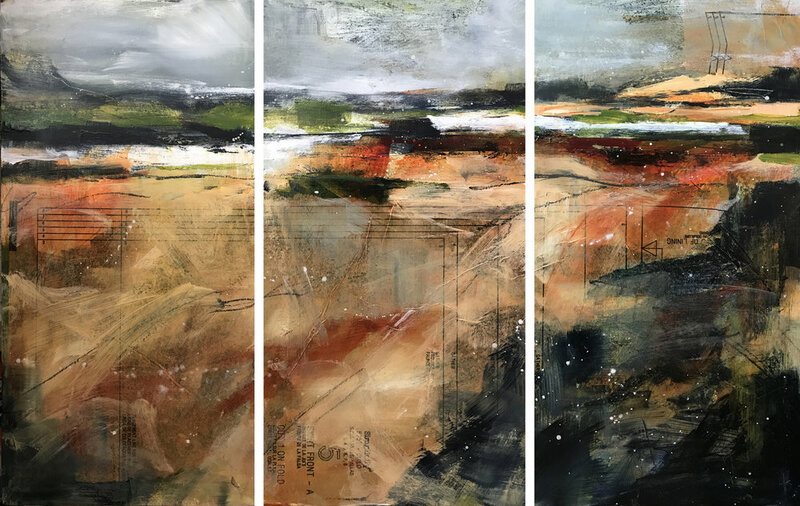 The proportions of sky, water and ground are the subject of her solo show, The Pursuit of Balance at Touchstone Gallery. Through her use of acrylic media and collage, she creates landscape images in an effort to find balance in an ever shifting world. Our current American reality is capricious. Each new sunrise seems to throw light on a new set of circumstances with which we must try to digest and respond. Our world continues to rock back and forth in terms of political and cultural shifts that make us question our own ethical compass. In the studio she found stability in the horizon, making small sketches that were related to the landscape; reaching for what is concrete and consistent. Her paintings begin with that horizon which sometimes shifts and reasserts itself throughout a composition. The foreground slides into background and line wanders in and out of focus. Space becomes interpretive to the viewer. Florimonte creates layered compositions that cover and reveal the history of her creative process and ultimately her pursuit of balance. In addition to being a veteran art educator with Fairfax County Public Schools, Florimonte has been a member of Touchstone Gallery for three years and exhibits her work locally and regionally; most recently at The Target Gallery, The Canal Park Glow Cube’s Art and the Environment and The McGuire Woods Gallery at The Workhouse Art Center.